These lines are not to be tattooed in. but used just as a guide for the letters. Later they will be wiped off to leave just the letters in perfect height Do not guess with the spacing of letters, they rarely come out right Always remember the sign "plan ahead." What you should do is determine where the center line on the banner or skin is. Put a mark (with pen) where the exact center of the banner is. Now add up the letters in the name or inscription, spaces count as one letter. If, for example, an inscription has five letters in it, you know that two goon one side of the center line, two on the other side and one right in the middle. This procedure simplifies Ehe spacing and saves you from repeatedly trying again and again to evenly space them. Sometimes with certain letters the gap between the letters won 't look right and an adjustment will be necessary to make it appear evenly spaced. Example: if spaced evenly, may look "gappy"
Remember that spacing isn't always a mechanical measurement between each letter but a flowing style of placing letters together which look correct to the eye. 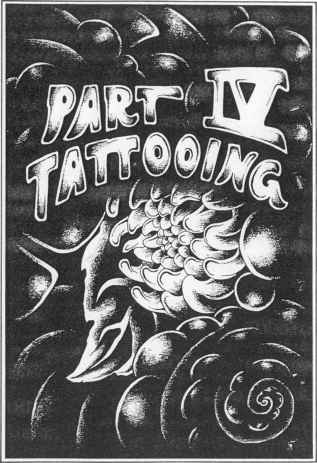 When tattooing letters that are inside of banners, besureto tattoo on the letter! first and then the banner second. This is done so that if the banner has tu be adjusted at the last second, it could be. When outlining letters, a good general rule to follow Is that the less stops and starts you make, [he belter the lettering. It makes for a more consistent (low. Biol away the ink after each step so you can see what you have done and where you ire going lor the next stroke. Some customers prefer names in a handwri iiogstylo, If they have better handwriting than you do. they can write what they wanton a guidellned piece of paper, which you set-up, and then you can copy it and stencil it .m ihe skin. 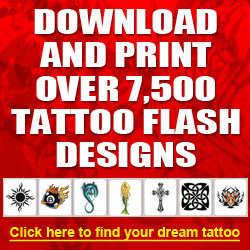 This appeals lo some, because their tattoo inscription will be in their own handwriting. Discourage the use of girlfriends' names in mtloos. These namesaro usually outdated in tiie majority of cases, and it leaves thecustomer with a name they no longer want no themselves. When people insist on it, just say no. If a compromise must be made, tattoo the name in a light red ink so when they return to get rid oris (and I key will), you can tattoo over it to hide it. See Chapter on Cover-ups for more details on this. One more important thing to bring up is spelling errors. You would be amazed at how many people are walking around with misspel led words tattooed on them. This looks bad and is very unprofessional. Never guess at a word that you don't know and have a dictionary handy lo look them up. Be positive at what you are s|jelling. If they are foreign words, have the customer spell them out for vou. and the same goes for names.